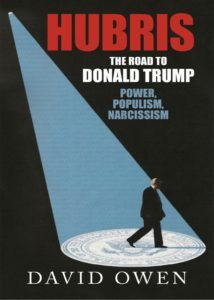 Hubris – the road to Donald Trump: power, populism, narcissism. David Owen analyses and describes the mental and physical condition of political leaders past and present with a particular view that what went before paved the way to President Trump. Of recent leaders there have been depressives, alcoholics, narcissists, populists and those affected by hubris syndrome and driven by their religious beliefs, as in Bush and Blair. But Donald Trump, a world class narcissist, presents a completely different set of issues. This book is the first to place him in his historical, political, philosophical and medical context. David Owen writes about the pivotal British War Cabinet meetings of May 1940. The minutes and documents reveal just how close Britain came to seeking a negotiated peace with Nazi Germany. 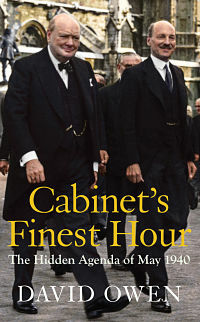 Cabinet’s Finest Hour is both the story of Churchill’s determination to fight on and a paean to the Cabinet system of government. The Cabinet system, all too often disparaged as messy and cumbersome, worked in Britain’s interests and ensured a democracy on the brink of defeat had the courage to assess the alternatives to figghting on. The post-war denial of both the existence and legitimacy of the war cabinet debates had far-reaching consequences for Britain’s foreign and defence policy for the rest of the century, starting over the Suez Crisis but reaching its nadir over the Second Iraq War. The way Labour transformed itself from 1931 to 1938 and the cross-party alliance in Parliament from 1938 to 1940 bear lessons for today. 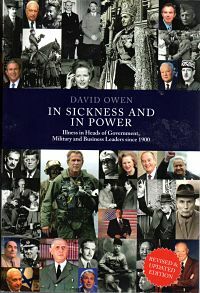 Political leaders’ ill-conceived decisions are often connected to their own illness, claims David Owen in a revised and considerably updated version of his original 2008 edition. In Sickness and In Power looks at illness in heads of government since 1900. The 2016 edition contains a new chapter dealing with the military and considerable new material on business leaders. It considers how illness and therapy – both physical and mental – affect the decision-making of heads of government, engendering folly, in the sense of foolishness, stupidity or rashness. Owen is particularly interested in leaders who were not ill in the conventional sense, whose cognitive faculties functioned well, but who developed a ‘hubristic syndrome’ that powerfully affected their performance and their actions. Whether it be examples from politics, business or the military, they suffer a loss of capacity and become excessively self-confident and contemptuous of advice that runs counter to what they believe, or sometimes of any advice at all. 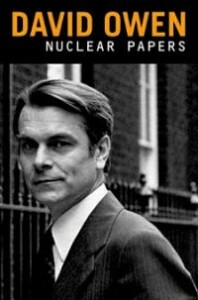 Long fascinated with the inter-relationship between politics and medicine, David Owen uses his deep knowledge of both to look at sickness in leaders. Owen expertly scrutinises such diverse political personalities as Sir Anthony Eden at the time of Suez in 1956; John F. Kennedy and the Bay of Pigs fiasco in 1961; the last Shah of Iran; and President Mitterrand of France who suffered from prostate cancer. The author also devotes a chapter to the hubristic behaviour and relationship between President Bush and Prime Minister Blair. The book ends by outlining some of the safeguards that society needs to address as a consequence of illness in leaders. Purchase the book here: In Sickness and In Power. The EU’s attempts at conflict resolution have left much to be desired. In the Ukraine, the Baltic States, Turkey and much of the Middle East, there is a lack of coherent policy. 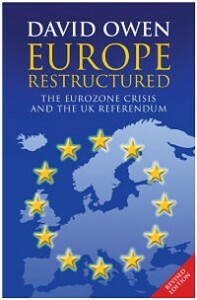 This pamphlet argues that the renegotiations around the UK’s referendum vote represent an opportunity to enact wide-scale reform, not least to ensure that the nations of an increasingly politically integrated Eurozone do notcome to dominate the Foreign and Security policy of the EU in years to come. To allow them to do so would almost certainly see the policy of ‘common defence’ advance at the expense of the United States’ lasting commitment to NATO. 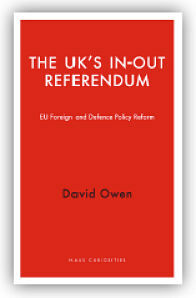 Former Foreign Secretary David Owen argues that should Britain’s reform negotiations with the EU fail there will be serious implications for our security, and that foreign policy and security belong at the heart of the reforms the EU so desperately needs. Or for 99p, you can access a version for Kindle. Six years on from the global financial crisis the Eurozone is still in the midst of its own economic crisis. Greece’s problems are not resolved. The French and Italian economies are still not grappling with their need for radical change and there are weaknesses in other Eurozone economies. These economic problems and the geopolitical problems of the wider Europe like Ukraine are inextricably linked to whether the UK will decide to remain in the EU. It will be a catastrophe if the EU dismisses the UK referendum as one of little significance, a matter just for the British. In his book Europe Restructured Lord Owen provides a negotiable blueprint for a restructured EU Single Market within the European Economic Area. It allows for more and more opt outs for the UK as it lifts its veto on the necessary ever greater integration of the Eurozone in order to alleviate its six year crisis, and as the Eurozone inevitably introduces more and more Qualified Majority Voting. He advocates the UK remaining in the EU Single Market within the European Economic Area (EEA), and that this area should be opened, in principle, to all of the wider European states as full voting members when they fulfil the criteria for entry, such as Turkey, already an associate of the EU, and Switzerland. But they are not offered free movement of people and labour. Also in future any EU country like the UK that does not want to be in the Eurozone nor in the Schengen group and wish to retain control of its own borders they would no longer be obliged to offer free movement of people and labour to any new EU member. That means that eight countries* in the queue for EU membership would be stopped from the automatic right to come into the UK. This is a huge but necessary reduction in potential open access to the UK. Unlike over Poland, Bulgaria and Romania it means closing an open door before it happens. The distinction that makes this possible is that free movement is not essential for a Single Market but is essential for an ever-greater integrated Eurozone. By reviving Political Cooperation for those Single Market EEA counties who wish to participate and who are not in the Eurozone, the way is paved for the UK to opt out from the pretension of an evermore integrated Common EU Foreign and Security Policy and EU integrated common defence. Gone would be all the tortured and deeply damaging wording in the Nice and Lisbon Treaties that still stand and threaten the UK’s self-government. Political Cooperation served the UK well in the past for cooperating and coordinating foreign and security policy. The National Health Service is the most enduring of the institutions created by the first real Labour Government, elected in 1945. Before the NHS was created, treatment of ill health was provided by doctors in their surgeries and in hospitals, all of which had to be paid for by the patients. Many poorer families paid their GPs a monthly sum as they were usually in arrears with the fees. The Labour Government’s vision was for a health service free for everybody and this was launched in 1948, with Aneurin Bevan as first Minister for Health. Now after nearly 70 years, with the costs of the NHS running at some £120 billions annually, and threatened by the 2012 Health and Social Care Act, the NHS is in danger of being classed as any other utility, gas, water, electricity and is imminent danger of marketisation and commercialisation. In his book The Health of the Nation, David Owen has explained the consequences of the 2012 Act and the damage to the NHS that will result. Those most affected will be those who can least afford good health care. 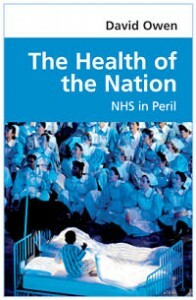 This book presents a powerful case for the repeal of the 2012 Act and for the restoration of the NHS to its traditional values. Within weeks of taking office in December 1905, Foreign Minister Edward Grey agreed toenter detailed talks with his French counterparts about sending a British Expeditionary Force to France in the event of a German attack. Neither the Cabinet nor Parliament were told. Indeed, Grey only informed Asquith in 1911, three years after he became Prime Minister, by which time the ‘hidden perspective’ of the Foreign Office, whose attitude was described by the German Ambassador Metternich as ‘more French than the French’, was firmly established, and Britain all but obliged to stand by their side in the event of a war. Following a Cabinet revolt after the details of the Military Conversations were at last revealed, Haldane, the Secretary for War, attempted to slow Germany’s rapid naval expansion on a mission to Berlin, advocating a land deal in Africa as an incentive. These talks failed, with Britain backing off from the words ‘benevolent neutrality’. But another mission to Germany was underway as late as July 1914. 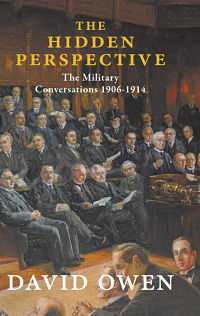 In this scholarly and eloquent work, building on extensive primary sources, Lord Owen argues that the outbreak of war in 1914 was far from inevitable, and instead represented eight years of failed diplomacy. Britain was the only country with the political and military strength to force Germany and France to negotiate, and instead was stuck in the mud of the continent. The perils of a foreign policy not involving Cabinet are particularly relevant today, and when the Iraq Inquiry publishes later this year these lessons will once again be brought to the forefront of public discourse and debate. In 1992 David Owen was appointed the EU Co-Chairman of the International Conference on the Former Yugoslavia, working alongside the UN’s Co-Chairman, Cyrus Vance. The papers collected here provide fascinating primary source material and an insider’s account of the intense international political activity at that time, which culminated in the Vance-Owen Peace Plan (VOPP). At a time when the international community is looking again at whether and how the Dayton Accords and the 1995 division into two entities should be adjusted in Bosnia-Herzegovina, Owen highlights elements of the VOPP which are of continuing relevance and which can guide political debate. Sadly, Bosnia-Herzegovina is still deeply divided, a direct consequence of not imposing the VOPP. The book reminds the international community and the people of Bosnia-Herzegovina that a unified structure for their country is still achievable. In this 2012 revised edition of The Hubris Syndrome, first published in 2007, David Owen has drawn on new material that he has written in Brain and other medical journals. He has also drawn on published memoirs of the main players in the Iraq war and on evidence given to the Iraq Inquiry. All this reinforces his earlier assertion that George W Bush and Tony Blair developed hubris syndrome during their terms in office. From their behaviour, beliefs and governing style, Owen has analysed the two leaders, with particular reference to the Iraq War, to show that their handling of the Iraq War was a litany of hubristic incompetence. During Blair’s premiership, David Owen had several meetings and conversations with him that afforded a unique insight into his modus operandi. 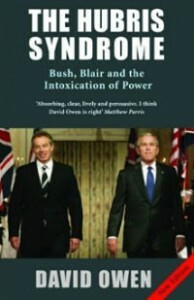 In this book Owen presents a devastating critique of how Bush and Blair manipulated intelligence, ignored informed advice and failed to plan for the aftermath of regime change in Iraq. Their messianic manner, excessive self-confidence and belief that they would be vindicated by a ‘higher court’ brought chaos to Iraq and resulted in hundreds of thousands of civilian casualties. Originally published in advance of the 2010 inter-governmental Review Conference of the Treaty on the Non-Proliferation of Nuclear Weapons, Nuclear Papers made available for the first time newly declassified government correspondence from David Owen’s tenure as Foreign Secretary and an insight into the work of, and response to, the last major strategic nuclear study of the UK’s nuclear needs, which was undertaken in 1978. 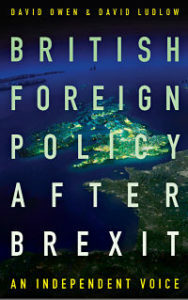 The book demonstrates sustained dialogue between the Callaghan and Carter administrations on the one hand but also the internal disputes and concerns of the UK government as the Cold War and a bleak economic outlook exerted equal pressures, in much the same way as recent foreign policy and the economic downturn have challenged the current government. Owen skilfully ties the events of 30 years ago to the present, highlighting Barack Obama’s determination to “show the world that America believes in its existing commitment under the Nuclear Non-Proliferation Treaty to work ultimately to eliminate all nuclear arms”. This book is an attempt to rejuvenate and expand discussions on the future of the world’s nuclear weapons by exploring the classified and highly sensitive debates of the past. It will be required reading for anyone interested in UK and US nuclear policy. 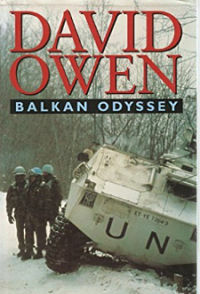 There are few individuals who have been as closely identified with attempts to bring peace to the war-torn Balkans as David Owen. 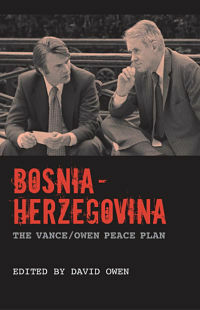 In 1992 the former Foreign Secretary was appointed the European negotiator charged with bringing the conflicting parties around the conference table to hammer out compromises that could then be implemented on the battlefield, and for three years he strove both to contain the various wars in the former Yugoslavia and to impose a peace plan on a political impasse which consistently defied solution. This anthology, organised on the basis of the seven ages of Shakespeare’s As You Like It explores our rich poetic heritage. 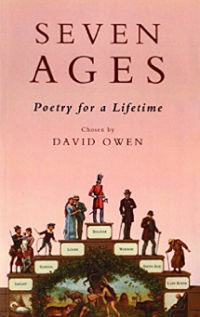 The ages represented by the Infant, School, Lover, Soldier, Wisdom, Sixth Age and Last Scene provide the framework for the poems. Copies available now on a print-on-demand basis via Anthony Rowe: +44 (0)1323 434700. 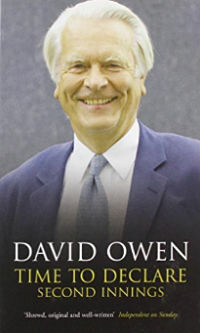 Eighteen years ago when interviewing David Owen on the publication of his autobiography, David Frost said “I love the title – Time to Declare – because – in cricketing terms it means you can have a second innings.” This book is Lord Owen’s first and second innings in political terms. His original autobiography has been substantially reduced to focus on what is relevant today. A third of the book is devoted to his second innings with chapters on his time in the Balkans 1992-1995, the “Yes to Europe, no to the euro” campaign he led as Chairman of New Europe from 1999-2005 and chapters on Tony Blair and Iraq, Gordon Brown and the financial crisis 2007 onwards, the Hubris Syndrome of Presidents and Prime Ministers and finally a timetable for political reform aimed at whichever government emerges out of the 2010 General Election. Drawing on the history of growing government incompetence, of ever increasing stress on spin rather than substance, the absence of Cabinet government and the scandals that have engulfed Parliament, David Owen argues powerfully and persuasively for a government of national unity to emerge from the 2010 election. He believes that the scale of the fiscal crisis facing any new government demands that they can speak for more than 50% of the electorate. He does not disguise his preference for a government made up of more than one party.